He was the first Chairman of The Atomic Energy Commission of India. Homi Jehangir Bhabha was born on 30 October, 1909 to a wealthy Parisi family in Mumbai that was very influential in the west of India. His father was Jehangir Hormusji Bhabha, a lawyer. Initially Bhabha attended Cathedral School and he then enrolled for studies at Elphinstone College at the age of fifteen. This was followed by further studies at the Royal Institute of Science in Bombay. Bhabha’s father and uncle, Sir Dorab Tata, wanted him to study engineering at university so that Bhabha could take up a senior position at the Tata Iron and Steel Company on completion of his degree. In 1927, Bhabha began his studies at Cambridge University, studying mechanical engineering according to his family’s wishes. Soon, however, Bhabha became more interested in theoretical physics, being influenced by physicist Paul Dirac. After passing the Mechanical Engineering Tripos with first class Bhabha remained at Cambridge and with his family’s approval began studying theoretical physics. In 1932 he passed the Mathematics Tripos, again with first class and he received his doctorate degree in nuclear physics from the University of Cambridge in 1934. Bhabha’s first paper “The Absorption of Cosmic radiation” in 1933 earned him a three year Isaac Newton Studentship in 1934. He worked alongside Neil Bohr in Copenhagen in addition to his research work at Cambridge. Bhabha published a paper in 1935, performing the first calculation to determine the cross section of electron-positron scattering. Bhabha conducted research with Walter Heitler and in 1936 they made a breakthrough in the cosmic radiation’s understanding by working on the cascade theory of electron showers. Their theory described how primary cosmic rays from outer space interact with the upper atmosphere producing observable particles at the ground level, making estimations of the number of electrons in the cascade process at different altitudes for different electron initiation energies. In 1937, Bhabha was awarded the Senior Studentship of the 1851 exhibition. With the outbreak of the Second World War in 1939, Bhabha returned to India accepting a position of reader of physics and establishing the Cosmic Ray Research Institute at the Indian Institute of Science in Bangalore. In 1941, Bhabha was elected Fellow of the Royal Society. He also established the Tata Institute of Fundamental Research in Mumbai, becoming their director in 1945. He was a skillful manager and it was due to his prominence, devotion, wealth and comradeship with Jawaharlal Nehru, Prime Minister of India that he gained a leading position for allocating the scientific resources of India. 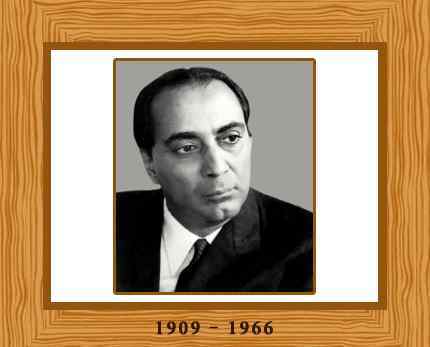 Bhabha become the first chairperson of India’s Atomic Energy Commission in 1948. It was under his direction that the scientists of India made their way into making an atomic bomb ant the first atomic reactant was operated in Mumbai in 1956. Bhabha also led the first UN Conference held for the purpose of Peaceful Uses of Atomic Energy in Geneva, 1955. It was then predicted by him that a limitless power of industries would be found through nuclear fusion’s control. He promoted nuclear energy control and also prohibition of atomic bombs worldwide. He was absolutely against India manufacturing atomic bombs even if the country had enough resources to do so. Instead he suggested that the production of an atomic reactor should be used to lessen India’s misery and poverty. A post in Indian Cabinet was rejected by him but he served as a scientific advisor to Prime Ministers Nehru and Lal Bahadur Shastri. He realized the potential of India’s large thorium reserves in addition to the country’s small uranium deposits. The total reserves of thorium in India amount to over 500,000 tons in the readily extractable form, while the known reserves of uranium are less than a tenth of this. The aim of long range atomic power program in India must therefore be to base the nuclear power generation as soon as possible on thorium rather than uranium..
Bhabha received many rewards and award from Indian as well as foreign universities and he was an associate of various societies of science including the American National Academy of Sciences. He was awarded Padma Bhushan in 1954, the third-highest civilian award in India. Bhabha remained a bachelor during his life. His hobbies included painting, classical music and opera, and botany. He was killed in mysterious circumstances, aged 56, when Air India Flight 101 crashed on January 24, 1966 near Mont Blanc in Switzerland. In quantum physics, the cross section of electron-positron scattering was renamed “Bhabha scattering” in his honor.